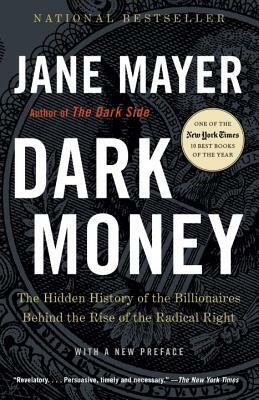 Jane Mayer is a staff writer for The New Yorker and the author of three bestselling and critically acclaimed narrative nonfiction books. She co-authored Landslide: The Unmaking of the President, 1984–1988, with Doyle McManus, and Strange Justice: The Selling of Clarence Thomas, with Jill Abramson, which was a finalist for the National Book Award. Her book The Dark Side: The Inside Story of How the War on Terror Turned into a War on American Ideals, for which she was awarded a Guggenheim Fellowship, was named one of The New York Times’s Top 10 Books of the Year and won the J. Anthony Lukas Book Prize, the Goldsmith Book Prize, the Edward Weintal Prize, the Ridenhour Prize, the New York Public Library’s Helen Bernstein Book Award for Excellence in Journalism, and the Robert F. Kennedy Book Award. It was also a finalist for the National Book Award and the National Book Critics Circle Award. For her reporting at The New Yorker, Mayer has been awarded the John Chancellor Award, the George Polk Award, the Toner Prize for Excellence in Political Reporting, and the I. F. Stone Medal for Journalistic Independence presented by the Nieman Foundation at Harvard. Mayer lives in Washington, D.C.